Melaka marked the end of our amazing time on the Malaysian Peninsula, and we were now heading over the South China Sea to East Malaysia, on the Island of Borneo, where we were set to explore the states of Sarawak and Sabah. This involved an early morning rise and taxi to the bus station, to catch the 8am bus to Kuala Lumpur airport. The 2-hour bus journey was uneventful, and we got to the airport with a few hours to kill. We had what was probably the worst breakfast of the trip from KFC, so with only ourselves to blame. I had also managed to pick up a sore throat over the past couple of days, so poor Sadie had to listen to me moaning and even tried to convince me to be quiet to help my throat… as if ha-ha! 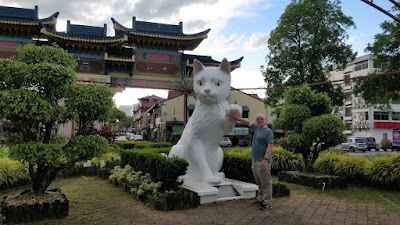 It was a short flight over to our next destination of Kuching, which is the state capital of Sarawak and is famous for its love of cats, cat statues, weird government buildings and it's colonial history. Deciding to stay here for 5 nights, we got a taxi from the airport to our hotel and got checked in. Our accommodation was called Lot 10 Boutique Hotel, and it just came within our budget with breakfast included so we didn’t expect too much. We were both pleasantly surprised to have a large, clean and comfortable room with all we needed, and it turned out that breakfast each morning was buffet style, with plenty of local and western options to help ourselves too, which all was more than adequate for us. 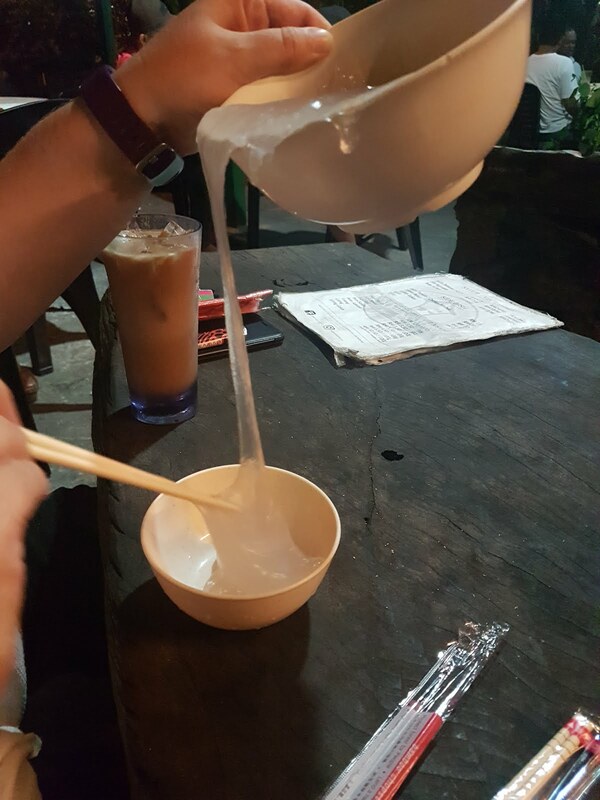 That evening we just went for a walk along the Chinatown area, found a pub called Ambience which had jugs of beer for less than a £1 and then went to a hawker centre called Top Spot for dinner. This comes highly recommended on Trip Advisor and various online blogs, and it didn’t disappoint. The bulk of the stalls all had fresh seafood, most of which were still swimming or sitting in tanks, and you just walked round till you seen something that you want. The choice was incredible and there was plenty there that we didn’t even know what it was. We played it safe and ordered some Fried Calamari done in egg yolk and Prawns in Garlic and Chili, both delicious and plentiful. We had wanted to try some cooked Midin, which is a wild fern unique to Sarawak, but the stall we picked had ran out. The next morning after stuffing ourselves at breakfast, we took a walk to the waterfront to take in some of the sights of the city, seen some lovely street art and then we went to a mall to cool down again (we do this a lot!) and then it was back to the hotel to plan out our time here in Kuching. 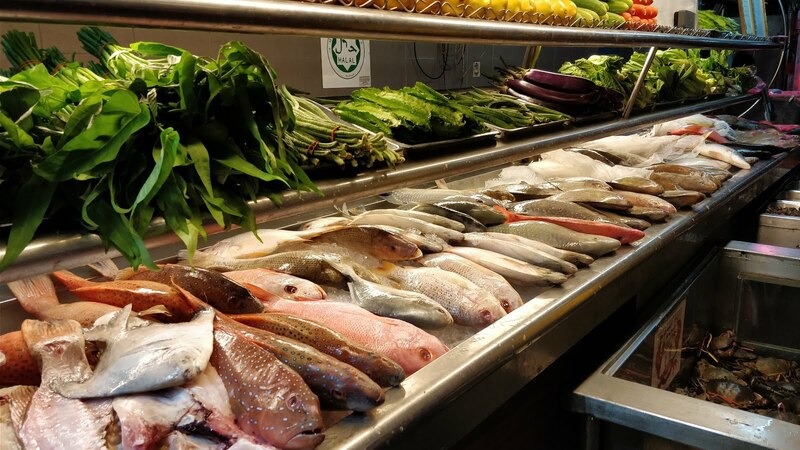 I’d found a place near our hotel called Lepau for dinner that evening, which comes highly rated and does traditional local cuisine, so we headed there. Our waiter was very helpful and picked some of their popular dishes for us to try, we had Pansuh Chicken, which is cooked inside a bamboo cane and then served with the water/stock it is cooked in. We also managed to get more prawns and even tried the Midin, I wasn’t that keen on it but Sadie enjoyed it. 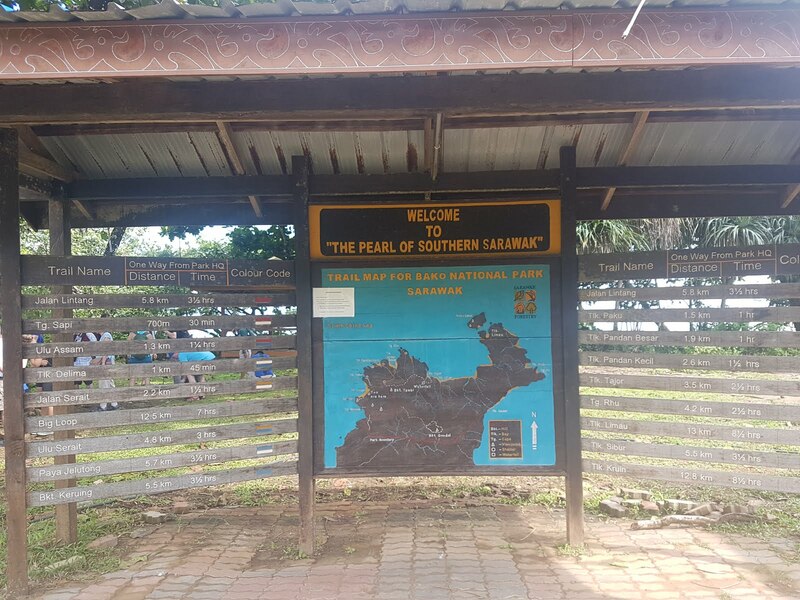 On our 2nd full day, we had decided to go to Bako National Park, where we had the chance to possible catch sight of the rare Proboscis Monkey along with our various mammals, birds and to enjoy the jungle trails. There were organised tours which you can book and they take you there, but at more than 3 times what you can do it yourself for, we took the decision to do it ourselves as it seemed easy enough from what we had researched. So off we went after breakfast to catch the 8am bus, which we had discovered comes along the waterfront from the bus terminal and passes quite near to our hotel. The bus stop we got it from was on Jalan Abell just outside the Alliance Bank, and the fare was 3.50MYR each way per person. 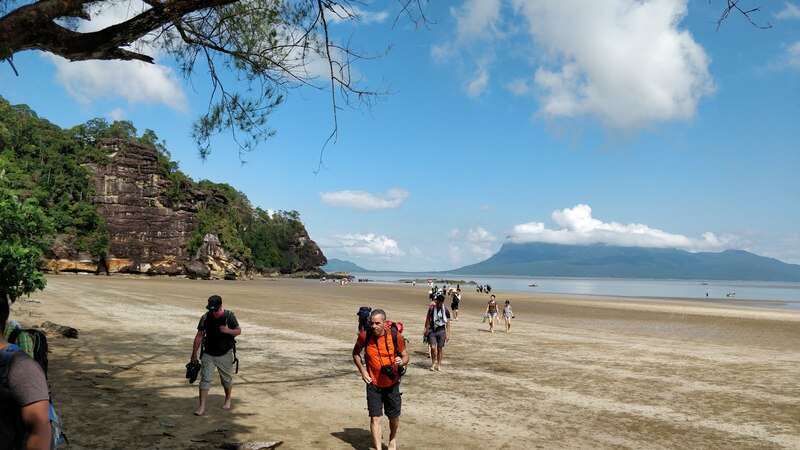 The bus takes just over 30 minutes and takes you to the Bako National Park terminal, where you then need to get a ferry across to the HQ. At the terminal you need to buy your park entrance ticket for 20MYR per person and then pay for the boat journey, which costs an over-inflated 40MYR return per person, but seeing as it’s the only way to get there, you have no option for the short 20-minute journey. The boats apparently run to a schedule, but it was more a case once there is enough people on-board (approx. 10-12) then they left. Heading out along the stream towards the park, you can see all the traditional Malay Kampungs (villages) with their wooden frames in the water for fishing and traditional longhouses along the banks. It’s a lovely scenic journey and before long you arrive at the shore at the park. It’s low tide so to get ashore it’s shoes off and jump into the murky brown water to the brown sandbank. The first thing we seen when walking over to the park HQ was thousands of little sand crabs scurrying across the sand and into their burrows, it was difficult to see them so hopefully didn’t squash too many! We then noticed a Bornean Bearded Pig, which are easily recognised for their beards, just casually out for a stroll along the sea. 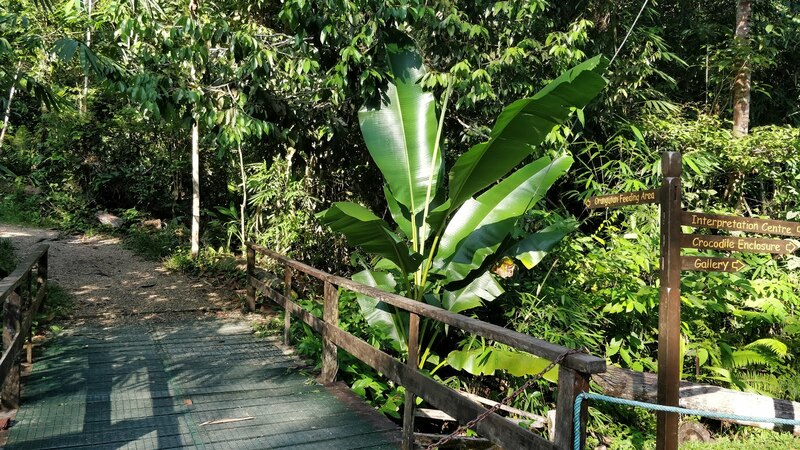 Bako NP has around 16 trails you can go on, varying from short 1km ones to others that stretch right across to the other side of the park. Some were closed for maintenance and being two relatively unfit people, we had decided to pick a couple of the easier ones, which are apparently the best for spotting the proboscis too. So, after registering at the HQ to let them know what trail we were on, off we set into the jungle and it started off well with a nice flat walk, where we saw some more bearded pigs, a couple of monitor lizards and lots of fiddler crabs. 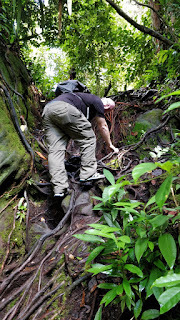 The trail then started to get a bit steeper and before long we were clambering up and down creaky wooden steps, scrambling up and down tree roots and holding on to rocks and branches as we went along the ‘easy’ trail. About an hour later, we reached the end of the trail which came to a beach a bit further round the island. A quick rest and then we made our way back along the trail, getting back to the HQ for a well-deserved rest. My knee has been playing up a bit over the past month, and it was giving me a bit of grief after the mornings efforts, so we decided to just have a little stroll around the park HQ and then head back to the boat to take us back to the mainland, sadly without seeing any proboscis, but plenty of macaques who were trying to steal all the food off unsuspecting tourists! We didn’t have long to wait for the bus back to Kuching, and the driver kindly dropped us off just around the corner from our hotel, where we went back to chill out and plan a bit more of our time. That evening we fancied some western food, and in particular meat so I found a place called The Granary, where Sadie had eyed up the Pork & Friends Platter, which came with Pork Ribs, Pork Belly, Beef Steak, Piri-Piri Chicken, Wedges and 4 dips… just what we wanted/needed after a hard day! The next morning, we took a taxi to the Cat Museum, which is based on the ground floor of the City Hall. The museum is free, but you need to pay 3MYR each for using a camera. 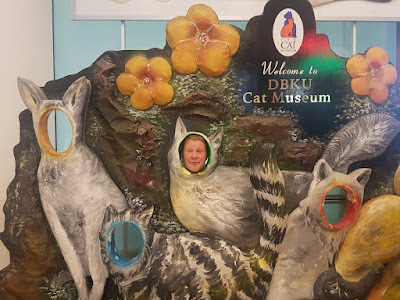 This place claims to be the world’s first cat museum, I’d hazard a guess it’s probably the only one, and the strangest museum I have ever been too. It’s full of weird and wonderful cat artefacts, over 4000 of them apparently. It wasn’t too bad, and a good way to waste a couple of hours out of the afternoon sun. We just headed back to the hotel after that, and then went back out around 5pm to the cheap bar we found the first evening. 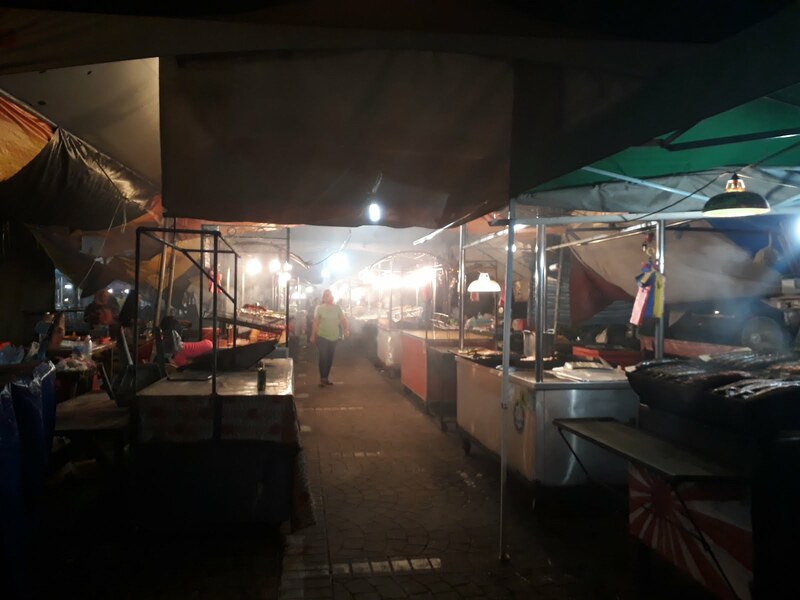 After a few, we walked along the waterfront which had now come to life with food stalls, traders and lots of sparkly lights. The sun was just starting to set, and the clouds above the bridge in the distance were staggering. We made our way onto the bridge to take some photos, but as usual they never capture the magic that was in the sky. The bridge is a new addition to the city, and the locals seem quite proud of it as it’s been mentioned by a couple of taxi drivers to us. 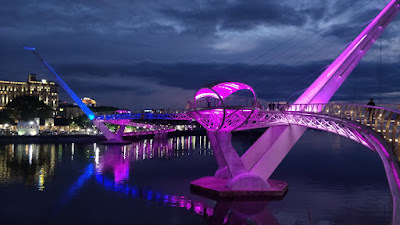 It’s a pedestrian only bridge, which has a sloping walkway up to it at either end and 2 huge cantilevers which suspend the walkway across the river, and it also has a couple of viewing areas at either end. As the sun began to fall, the bridge suddenly came to life with thousands of LED lights, which lit up all of it. And they faded into various colours, giving the effect of them chasing each other, it was pretty impressive. Before the bridge was built, the only other way across to the Kampungs on the other side was to either go a long way out your way to a bridge, or use the local Sampan boats which ferry you across for the tiny fee of 1MYR each. 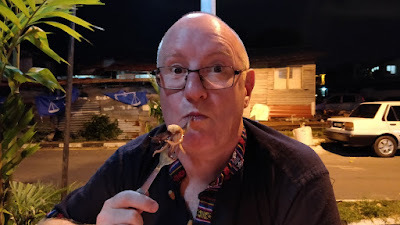 As I wanted to try one of the local restaurants on the other side, we went to get the boat over and then found a restaurant called My Village Barok, where we ordered some more chicken done in bamboo, BBQ lamb chops, rice and some Linut which was described by the waiter as being like glue! And he wasn’t wrong, I couldn’t eat mine but Sadie managed one small bowl out of the huge bowl we had. Sadie also managed to have a few ants in her rice, so we quickly paid the bill and left. I’d also read about the famous Sarawakian Layer Cakes from these villages, so after finding one of the recommended places to go, we had plenty samples of all the flavours and then bought an Oreo flavoured one, which was delicious. We then got the boat back over the water, decided we were still hungry and went to McDonalds for a burger… well at least it came without ants! 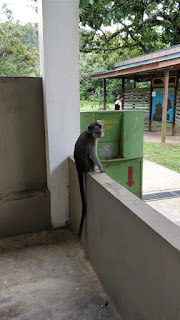 Our last day in Kuching involved another early morning rise for breakfast and then a taxi out to Semenggoh Wildlife Rehabilitation Centre, which is about 45 minutes away from Kuching. Again, we could have paid to go on an organised tour to the centre, but it was just as easy to self-do and a lot cheaper again. This facility was set up in 1975 to care for wild animals that had been kept illegally, injured, orphaned or displaced from the jungle by the ever-growing palm oil plantations or deforestation. 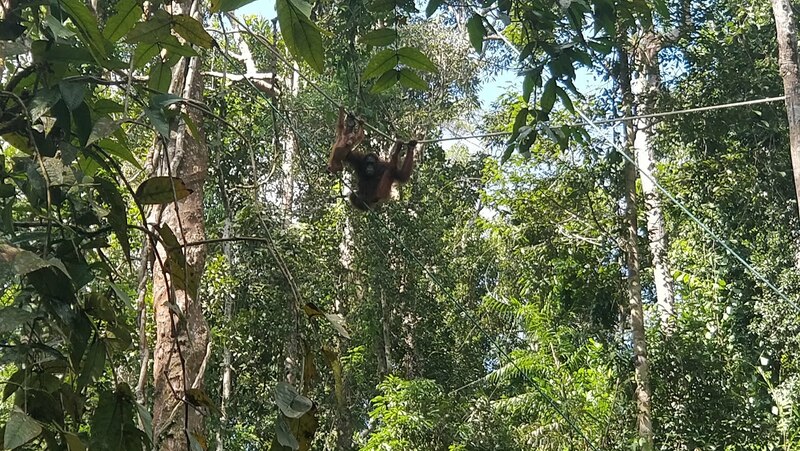 It no longer functions as this, but over the 20 years that it was in use, they successfully trained, rehabilitated and released Orangutans back into the 650-hectare forest. These have now had families out in the wild, but still come back to the centre twice a day for feeding, if they are hungry of course. In an ideal world they wouldn’t need this centre, or come back for food at all… but we were both hoping to get a glimpse of a semi-wild orangutan, so we paid our 10 MYR each and walked up the path to the HQ and waited patiently for feeding time, which was 09:00 – 10:00. More and more crowds gathered, most of organised tours with their guides, and there was probably around 60-70 people there by the time we got our briefing from one of the wardens. He kindly reminded us of a few basic rules and safety procedures, as although these are semi-wild, there has been incidents in the past where people, including wardens, have been injured by them. 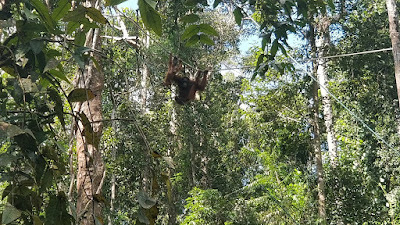 We then proceeded up path for 5 mins up to the feeding area, and as soon as we got there, we seen one Orangutan there already tucking into some bananas. 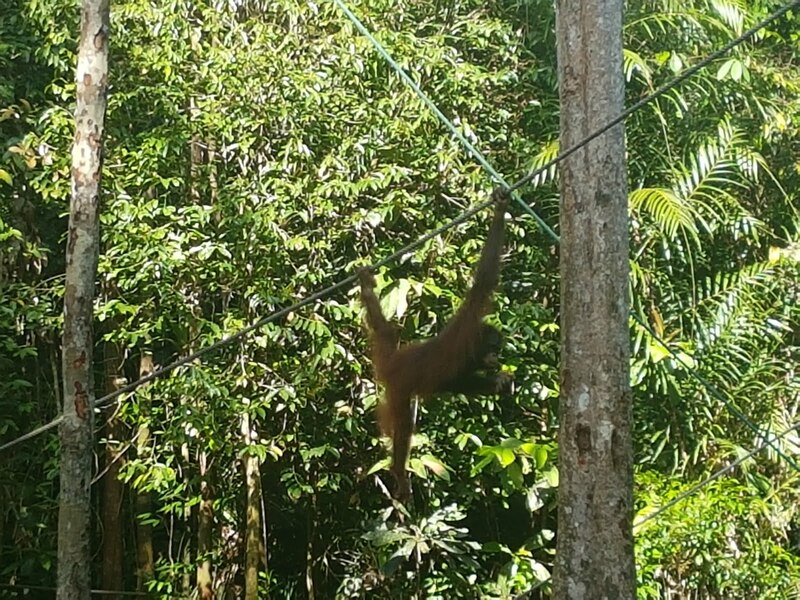 We later found out she was called Endo, and she hung around for 15-20 minutes, eating and posing on the ropes and trees for all the cameras that were out. She disappeared off into the distance and then another 20 minutes passed before we heard one of the wardens walk from the feeding platform shouting on them. Although this isn’t an ideal way to see them having to be coached to appear, we still wanted to see more than 1. Sadly, some people couldn’t wait patiently as small pockets of conversations broke out amongst the crowd, and one Chinese lady who decided to take a phone call, which Sadie quickly told her to shhh. 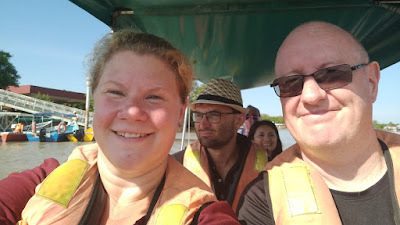 There was also 2 of the tour guides from a company called Insight Borneo, who spoke pretty much the whole time there, who were getting on my nerves. Then we spotted another couple up in the nearby trees, one of which had her new born with her. They were on their way, but taking their time. As we were limited for time there, with only 1 hour allocated for feeding, the people talking were probably not helping matters. I’d had enough of the 2 guides chatting, so went up to them and kindly asked them to shut up as they should know better! Thankfully we were rewarded with the mother and her 1 month old new born coming closer across the trees and ropes, then down towards the feeding platform, both seemingly posing again as more photos were taken, before we sadly had to leave the area. 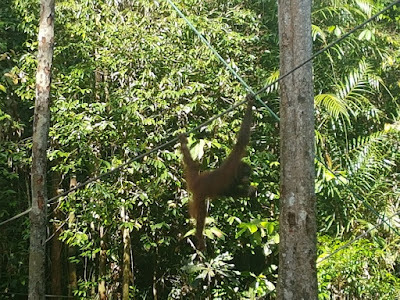 We were glad we done this, as although it isn’t the best way and not fully wild, it may be the only way we see Orangutan whilst in Borneo, but we also wanted to maximise our opportunities so hence going there. After leaving the centre, we caught the bus back to Kuching for 4MYR, which took an hour and dropped us off in the centre of town. We went across to the mall for some air-con time, a cold drink and a look around the shops. Whilst in Langkawi back at the start of our time in Malaysia, I had dropped my phone and smashed the screen, and whilst it still worked ok, it wasn’t ideal to use with exposed glass and it had slowed down a bit too. I can’t get it repaired under insurance till back in the UK, so went looking for a temp replacement. We saw the Samsung Galaxy J7 Prime, which had a good spec and only £150, so decided to just get it for me to use during the rest of this trip. After a trip back to the hotel to get refreshed, we picked up our laundry and then back out to get that done, whilst having a few beers at our ‘local’ which happened to be next door! 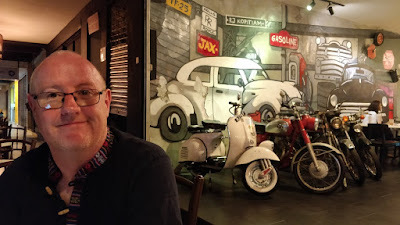 We then went around the corner to another local cuisine restaurant, but this time one that had good reviews. We both ordered their recommended special dish of BBQ Chicken & Rice, which was delightful. 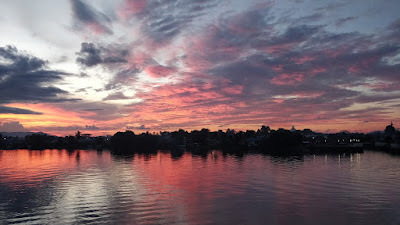 And that was the end of our time in Kuching, we both enjoyed it there and with a lovely hotel too, we could have easily stayed another few days, but it was time to move on to our next destination of Miri, which was eastwards along the coast. It was either a 12-hour bus journey, or an hour-long flight to Miri. And when we looked at prices, there wasn’t much between them, so the flight option won. Another taxi-flight-taxi journey got us to our hotel in Miri mid-afternoon, a place called Yew Hotel. It was another basic hotel, clean and comfortable, but this time with no breakfast option. Miri is a small city on the coast of Sarawak, not far from the border of Brunei. 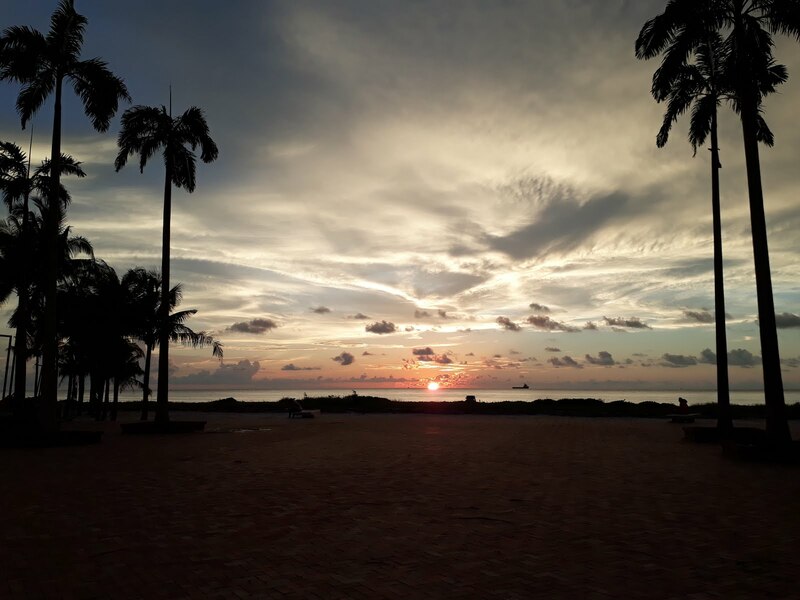 We had considered visiting Brunei whilst here, but with not really a lot to do there that interested us, along with the strict alcohol laws and expensive accommodation and living costs, we decided to skip it. After checking and settling in for the 3 nights we had booked here, we went out to see a bit of the town. It was yet another hot 30+ degree day, so when we found a nice-looking bar called Ming Café that was doing happy hour beers, we decided to stop for a couple. This was a typical tourist bar, but with a mix of locals and tourists, and had a decent choice of beers along with various happy hour offers and BOGOF offers too. Plus, they played some decent tunes, so we did decide to go for a little walk round and then come back here for dinner. However, we left to go a walk and found another place called Sea Village Seafood, where the temptation of the cheap fish and choice of cooking methods was too much, as we ordered a steamed seabass with garlic and calamari with ginger. We also had a few of the local cats join us, and happily tucked into the bits of fish we couldn’t manage. We then were heading back home, however Sadie wanted to use the loo and we were just across from Ming’s, so back we went there for a quick drink. Well that is where it started going downhill, as once we had ordered a couple of drinks, a table of 4 Aussie males had just got 10 Jagarbombs to their table, and the barman had them stacked close together in a line so when he hit the first one with a beer-mat, they went into the drinks like dominos. This 'trick' attracts people’s attention due to the noise, so they got some verbal encouragement from us and others to get them downed! I had noticed earlier a poster offering ‘Buy 5 Jagars, Get 5 Free’, and on enquiring the cost, it was 65 MYR (£12) for the 10. 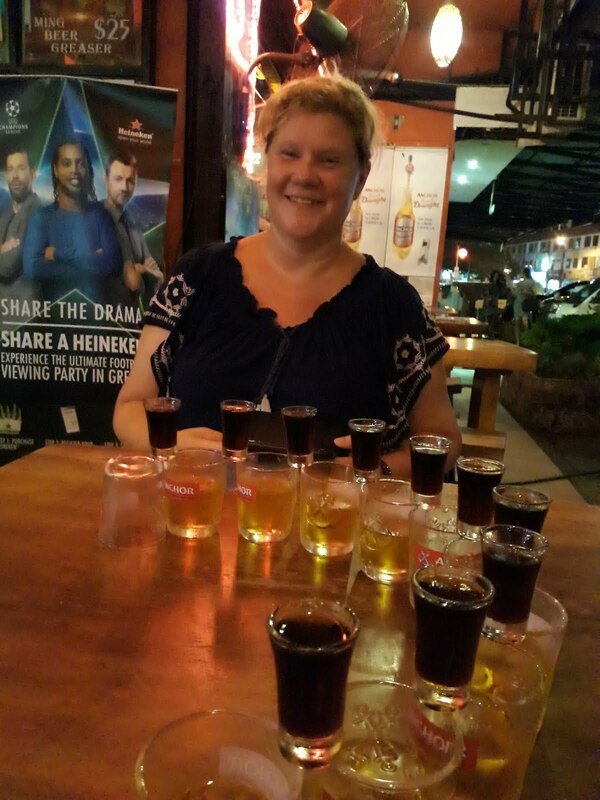 Needless to say, it wasn’t long till we ordered 10 for us, and again the barman set them up next to each other, but this time in a semi-circle, however only 8 fell into the glass and 2 didn’t. The 4 Aussies were watching us this time, as I managed to knock back all 5 of mine with no trouble, but Sadie struggled with the last two and ended up having everyone watch her drink the last one. There was a bit of banter between us and them for a bit, then we just ordered another beer and a wine and did plan to go home after that. Then the DJ announced over the mic that for the next 5 minutes, you could get 10 Jagars or 10 Tequilas for 45 MYR (£8.50), so I decided we should buy 10 Tequilas, have 3 each and give the Ausssies one each as a surprise. We ordered them up, and got the bar staff to bring them to us, giving 4 over to their table… well a bit more banter took place, and Sadie couldn’t finish her last one, so gave that away to them. By that time, we were feeling a bit drunk, but one of the guys bought us another round of a beer/wine, so by the time we left there, we were a bit pissed! No surprises to say that the next morning was a right off, with us not going out the room till lunch time, heading over to the mall for sushi, donuts and iced coffees. Then it was back to the room to do a bit more planning for Sabah, only going out for an hour or so in the evening to a local night market, where we head a mixture of yummy street food. Our last day in Miri was again uneventful, as when we decided to stop here a few days, we didn’t realise that the National Parks we wanted to visit were a bit further away than we thought, so took the opportunity to just relax instead and catch up on this blog, photos and research for our journey ahead. We did go out for breakfast to a bakery, walked around another couple of malls, thought about going to the cinema and then just chilled out for the day. That evening, we went a walk along to the area known as Marina Bay, a fairly new development with various bars and restaurants a couple of km out of the centre. As soon as we got there, we caught the end of an amazing sunset with the sun sinking into the horizon in the distance over the sea, along with some pretty spectacular clouds. We strolled up and down a couple of the streets, before deciding on a placed called Overtime Bistro for dinner. We picked western food, and it didn’t disappoint with a bucket of Tigers to wash it down. Whilst we didn’t do much with our couple of days in Miri (the lack of photos gives that away), we did do a fair bit of research and booked a few things for Sabah, where we headed to next with another quick flight taking 45 minutes to Kota Kinabula. 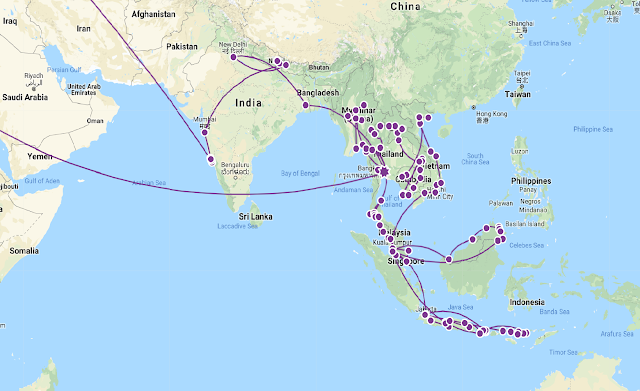 The reason we are doing a few flights over here is that they are really cheap, the roads are not the best and we are aware we have spent a fair bit of time already in Malaysia (6 weeks already), so Indonesia is calling... oh and our aim to see Orangutans in the wild was getting closer!